One of the most picturesque towns in the western part of Lycoming County is Salladasburg. It also is the home of the noted Cohick’s Trading Post, a Lycoming County institution. Captain Jacob Sallade founded Salladasburg in 1837, laying out lots for the town and building Lutheran and Presbyterian churches there. Located on Larry’s Creek and named for its founder, Salladasburg was incorporated as a borough on Jan. 12, 1884. Additions were made to it, Lycoming County’s smallest borough, in 1887. The first sawmill was built at Salladasburg in 1834 and the first gristmills were set up there in 1837. “In a short time, the necessary adjuncts of advanced civilization came to Salladasburg, including three blacksmith shops and other improvements rapidly followed,” so stated a centennial history of Salladasburg written in 1937. James J. Cohick founded Salladasburg’s most famous institution, Cohick’s Trading Post in 1924. It has hosted some very famous personages such as Katherine Hepburn, Herbert Hoover and James Cagney. The trading post continues to thrive today. According to John Meginness’ monumental “History of Lycoming County,” Sallade was born in what is now Crawford Township, Clinton County on Feb. 26, 1817. He grew up in a rural environment on his parents’ farm. His father operated a gristmill, the first in the Nippenose Valley, at Sallade’s Gap. After working on his father’s farm, Sallade helped build several flour and saw mills in various parts of the West Branch Valley. He later purchased timber land in the area of the borough that would bear his name. He became wealthy in the timber trade and other manufacturing ventures. In 1844 he moved to Williamsport, but still kept up his strong involvement in various business affairs in the Larry’s Creek area. At about this same time he served as a foreman on the building of the Pennsylvania Canal. He was one of the major figures in building Dickinson Seminary, now Lycoming College. 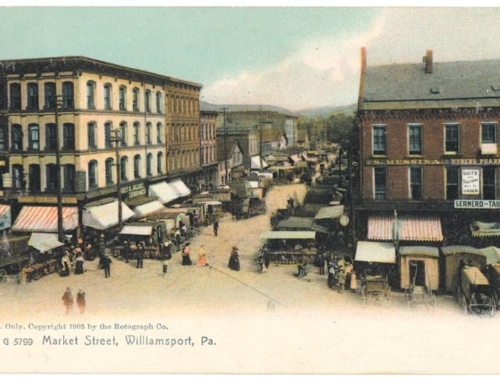 After moving to Williamsport he expanded his investments and involvement in various commercial ventures in the now rapidly growing town, fueled by the growth of the lumber industry. After the Civil War began in 1861 Sallade went to Washington and served as an agent in the Army’s Quartermaster Department. In February 1863 he was appointed an Army paymaster with the rank of major, and held that position in both Washington and New Orleans, remaining in the Army until retiring in 1866 with the rank of colonel. Using his extensive political contacts, Sallade was appointed postmaster for Williamsport in 1866. Upon his return to Williamsport he became involved once again in the commercial affairs of the city. He was one of the founders of the First National Bank. He also was still active in the affairs of the Larry’s Creek area, serving as one of the investors and builders of the Larry’s Creek plank. In 1879 he gained a controlling interest in the “Gazette and Bulletin, which he sold and then bought the “Sun and Banner,” and merged the two papers. He then served as the publisher of the newly merged newspaper for several years. Sallade died on March 9, 1896 at the age of 79.